With Summer officially here, I've been playing around with a lot of colour, both in my wardrobe and with my makeup. I normally do stick to a neutral eye, but I'm definitely not afraid of branching out and adding a pop of colour to my lids. I've recently been using MAKE UP FOR EVER's Aqua Shadow in the shade #8E* ($24 CAD) all over my lids to give a nice mossy colour. MAKE UP FOR EVER's Aqua Shadows are waterproof jumbo eye pencils. These are similar to Sephora's Jumbo Liners, but there are still some major differences in the two formulas. MUFE's formula creates a nice sticky or tacky base, which is perfect to layer powder shadows over top of. This formula does dry very quickly, so you really do need to be quick with your application. I draw the colour onto my lids, and then I blend it out with my fingers. 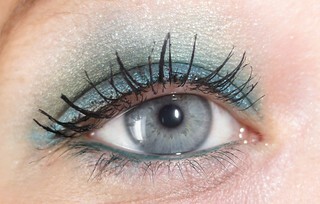 To create this eye look I started with MUFE's Aqua Shadow #8E, blending it out all over my lids. I then reached for my Sephora + Disney Cinderella Storylook Eyeshadow Palette* (reviewed here). I used the shades Cinderelly and Destined, which are lighter green shadows. I then reached for the shade Cinders, and popped in in my crease to add some dimension to my look. 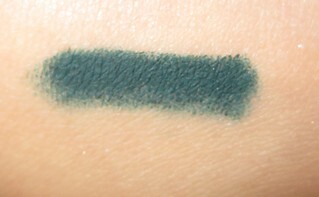 I also added MAKE UP FOR EVER's Powder Shadow in shade #80, a mossy green with a hint of shimmer, to my crease. For a brow highlight I used Ball Gown from the Storylook Palette. This does create a darker, slightly smokey eye look, so I decided to use Sephora's Jumbo Liner in the shade Peacock to my upper lash line. This is a beautiful metallic turquoise shade, and it really helps to brighten up your eyes. I then added a very thin line of MAKE UP FOR EVER's Aqua Liner #13 Matte Black* (reviewed here) to my upper lash line as well. I went back in with MUFE's Aqua Shadow #8E on my lower lash line. I finished off this eye look with Revlon's Lash Potion (reviewed here) on my upper lashes. These Aqua Shadow pencils are very long-wearing, and they last all day long on my lids. These won't budge on my eyes until I remove my makeup at the end of the day. If you have oily lids, this formula might be perfect for you. This product is waterproof, so it's a great option for those hot Summer days. The mossy green shade is perfect for adding a pop of colour while still being very wearable and office appropriate. If you're wanting to add some colour to your makeup, but you're not reading to venture into super bright or bold shades, this is a great option! Looks really pretty on you!